High-speed rail is a type of rail transport that operates significantly faster than traditional rail traffic. The first such system was the Tokaido Shinkansen, opened in 1964 between Tokyo and Shin-Osaka, Japan. It is widely known as the "bullet train," so nicknamed for its appearance and speed. Now you can build your own bullet train that fits in the palm of your hand! 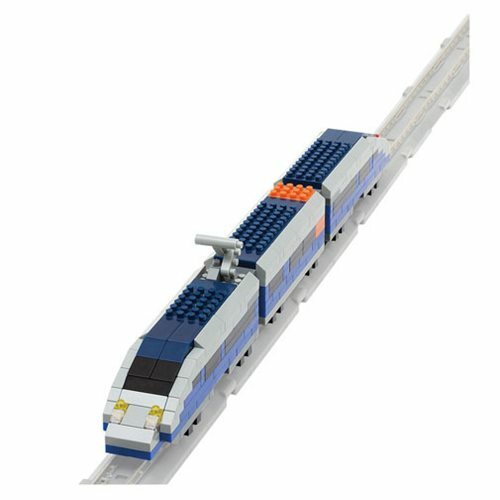 With these micro-sized building blocks, your 3D model will take shape right beneath your fingertips, and you'll be amazed as the Blue Bullet Train Nanoblock Constructible Figure is assembled to the tiniest detail. Note: Tracks and motor unit sold separately.